On March 10, 2015, Mr. Rob Steele, Secretary-General of the International Organization for Standardization (ISO), visited the International Center for Bamboo and Rattan (ICBR), and joined a meeting in establishing ISO Technical Committee for Bamboo and Rattan (TC-BR). Vice Minister Liu Dongsheng of State Forestry Administration (SFA) chaired the conference, attended by Ms. Yu Xinli, Vice-Administrator of Standardization Administration of the People’s Republic of China (SAC), Deputy Director General (DG) Guo Chenguang of Department of International Cooperation, SAC, Deputy DG Xu Changxing of Department of Agriculture and Food Standards, SAC, Deputy DG Hu Zhangcui of Department of Science and Technology, SFA, Deputy DG Wang Chunfeng of Department of International Cooperation, SFA, Deputy DG Li Zhiyong of International Network for Bamboo and Rattan (INBAR), Executive Deputy DG Fei Benhua of ICBR, Secretary-General Liu Shirong of Party Committee, ICBR, and delegates from SAC, Department of Science and Technology, SFA and ICBR. At the meeting, Executive Deputy DG Fei Benhua introduced ICBR in detail, systematically described the global distribution and trade of bamboo and rattan products, and the importance of establishing ISO technical committee for bamboo and rattan, comprehensively reviewed efforts devoted by SAC, SFA, INBAR and ICBR in establishing such a technical committee, and work scope of a to-be-established technical committee for bamboo and rattan. Mr. 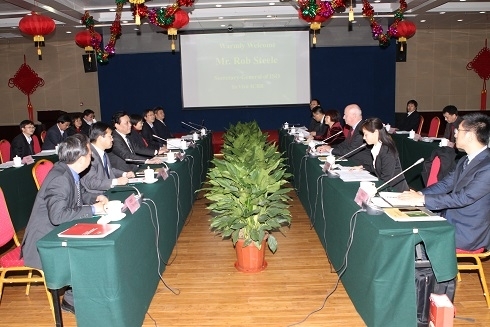 Rob Steele spoke highly of China applying for the establishment of ISO Technical Committee for Bamboo and Rattan, and he promised to provide the best possible help. He said with the variety of bamboo and rattan products, China turned out to be an international leader in innovation and research of bamboo and rattan products, and bamboo and rattan resources were distributed in many parts of the world. The establishment of ISO Technical Committee for Bamboo and Rattan will not only benefit the development of China, but also will bring more business opportunities for bamboo and rattan giants in the world. Vice Minister Liu Dongsheng thanked Mr. Rob Steele for supporting China to apply for a TC-BR. He pointed out that China highlighted standardization, set up 25 Technical Committees on Standardization, issued a number of over 1500 national and industrial forestry standards, hosted four related annual meetings of ISO technical committees, and led the preparation of 9 ISO international standards. The to-be-established TC-BR was conducive to the exchange of experience and information of bamboo and rattan industries worldwide, promoting the marketization of bamboo and rattan industries worldwide. The establishment of ISO TC-BR was inseparable from support and help of ISO and SAC. If ISO TC-BR was going to be headquartered in China, SFA will do its best to support TC-BR’s growth. Vice-Administrator Yu Xinli and Deputy DG Hu Zhangcui also delivered remarks to highlight the contribution of the establishment of ISO TC-BR to global bamboo and rattan industries. After the meeting, Prof. Jiang Zehui, Vice Chair, Committee of Population, Resources and Environment, Chinese People’s Political Consultative Conference (CPPCC), Co-Chair, INBAR’s Board of Trustees, DG of ICBR, met with Mr. Rob Steele. Prof. Jiang recalled the history of Chinese forestry standardization, introduced China’s market share in global import and export trade of bamboo and rattan in recent years. She wished that with the support of ISO, China could do a better job in promoting the standardization of bamboo and rattan, and to make a greater contribution to regulate trade and development of bamboo and rattan industries in the world. Mr. 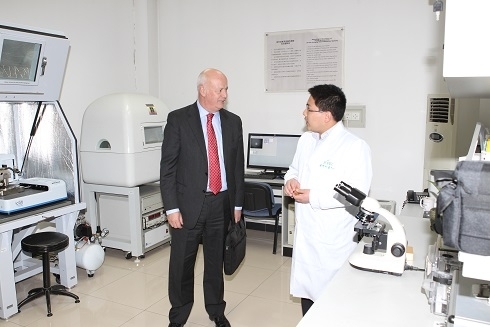 Rob Steele mentioned that China had done a lot of work in promoting standardization. It was quite feasible for China to apply for the establishment of a TC-BR. Later, both sides exchanged views on sharing and exchange of trees, bamboo and rattan resources, compliance of the application of a TC-BR, etc. In addition, Mr. 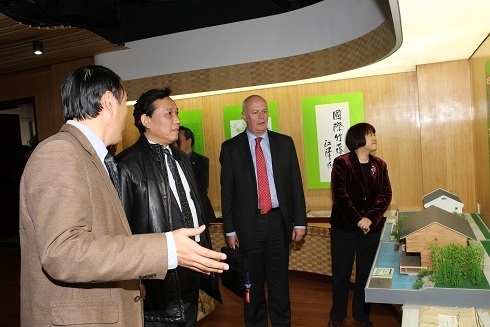 Rob Steele and others also visited the headquarters of INBAR, visited Bamboo and Rattan Showroom, and Key Laboratory on Bamboo and Rattan Science and Technology co-built by SFA and Beijing municipal government.